Meet Harley, the 2015 American Humane Association's Hero dog ! On September 19, 2015, Harley, a Chihuahua, who was rescued from a puppy mill four years ago, was honored as this year's American Hero Dog by the American Humane Association. 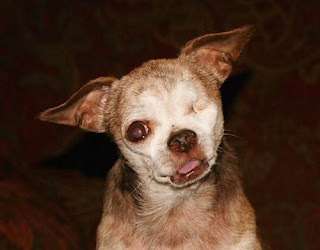 Harley spent the first 10 years of his life suffering from abuse and neglect in a breeding puppy mill. He lost an eye, among many other health issues, but survived (much to the surprise of his veterinarian). Harley has since become the poster boy for the "Harley to the Rescue" campaign, which helps raise funds to fight puppy mills.